Caption slip reads: "Photographer: Paegel. Date: 04-11. Reporter: Petty. Assignment: Newspaper day at USC. 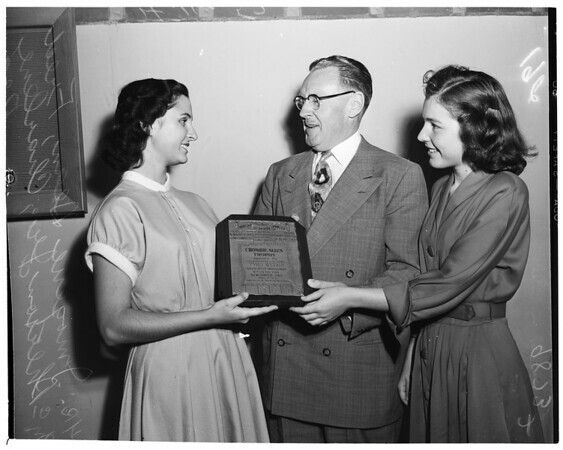 19-20-30, l to r: Imogene Dean, receiving annual Crombie Allen plaque from Fred McPherson, Jr., pres. of Calif. Newspaper Pub. Assoc., and Charlene Dean. Girls are juniors at San Bernardino High School. Their 'Tyro Weekly' was named most improved school publication."